What are the Battle Strategies in the Plant vs Pathogen Fight? Dr. Martin's research requires special attention from a group of talented scientists. Beyond human resources, your contributions will fund the purchase of supplies, bacteria growth media, enzymes, chemicals, and glassware, as well as external services to support research, including DNA and peptide synthesis and DNA and protein sequencing. Further, Dr. Martin pays a usage fee for greenhouses and growth chambers which include all plant care from a professional staff. Dr. Greg Martin is studying the interactions between plants and pathogens during attempted infections to gain insight into the plant immune system. Using a two-pronged approach--one focused on the plant's immune responses to invaders and the other centered on the ways a pathogen undermines those responses--he is uncovering both general and specific principles that have implications for plant and human health. From the plant perspective, understanding the details of pathogen infections will lead to the mitigation of crop damage without needing as many pesticides or other disease control methods. Instead, the natural genetic variation of plants can be used to develop plants that are inherently more resistant to diseases. Because the plant's initial immune response is similar in nature to human innate immunity, knowledge of the general aspects of pathogen attack, specifically bacterial infection, can also be applied to studies of the human immune system, potentially leading to better treatments to combat infection. Dr. Greg Martin, Boyce Schulze Downey Professor at the Boyce Thompson Institute for Plant Research and Professor of Plant Pathology and Plant-Microbe Biology at Cornell University, is studying the interactions between pathogens and the plant immune system to uncover information about how pathogens infect plants. Studying the plant-pathogen system, specifically the genes and proteins involved, leads to new knowledge about how bacteria cause diseases in plants. These observations often apply to pathogens infecting both plants and humans and therefore have implications for the development of strategies that will be useful in targeting pathogens in both agricultural and medical settings. At the same time, Dr. Martin is learning principles about the plant immune system that in some cases are also relevant to understanding the human immune system. Plants have many experimental advantages compared to humans, and performing experiments with them leads to discoveries that might be difficult or impossible to learn using other systems. When a pathogen is in the presence of a plant, the plant has the interesting ability to use extracellular protein receptors to detect the microbe by identifying highly conserved molecules, e.g., flagellum, cell wall fragments, specific proteins, that the pathogen generally needs for its lifestyle. These host receptors are partly outside and partly inside the cell, and upon detecting a threat they transmit a signal, which in turn triggers an immune response within the plant cell. In fact, humans share this stage of the immune system response in our innate immunity. This is similar to a guard posted at a turret in a castle, who signals a warning in the face of an invasion threat. In response to this warning, the warriors prepare for battle representing the plant's triggered initial immune response. Dr. Martin is working to identify which protein receptors plants have, and which components of the pathogen threat are being recognized. Despite the plant activating an immune response, many pathogens have devised methods to undermine that initial plant immune response. In order to infect the plant, the pathogen must interfere with the immune response. They do so by using a "syringe-like" device to poke through the plant cell wall and inject virulence proteins, so called because they promote pathogen virulence, into the plant cells, that focus on specific host "targets." This subversion of the plant's defenses can be likened to using a Trojan horse to sneak an invading army through the gates of an armed defense. Dr. Martin is identifying the ways a pathogen infects the plant by identifying which proteins are being injected and how they are interfering with the host cell's natural biological functions. In a step unique to the plant immune system, plants have discovered a method of launching a second, super-strong immune response by detecting specific virulence proteins. Although some 30 or so virulence proteins may be injected, the plant cell only needs to identify one to activate this secondary response, which has the potential to completely shut down the pathogen infection. Following the castle analogy, the host (plant) is now focusing its defenses on the invading army (pathogen virulence proteins) that are flooding out of the Trojan horse. Dr. Martin is working to discover which of the virulence proteins are triggering the plant's second immune response, what are the host proteins that are associated with the second immune response, and how do they combat the pathogen threat. At this stage, it appears as though the plant's defenses have won and have successfully pacified the bacterial attack. Common sense though will tell us by looking at an infected plant that this is not the end of the plant-pathogen battle. As it turns out, some pathogens have evolved further and now possess the ability to undermine even this second super-strong immune response. Though relatively rare, there are a few pathogen proteins that can do this. This back-and-forth battle is comparable to the invading army retreating with a few straggling soldiers, only to rebuild, preparing for another future fight. At this stage, Dr. Martin is identifying which pathogen proteins can undermine the plant's second immune response, and how are they able to further evolve to combat the second response. For his master's degree at Michigan State University, Dr. Martin conducted research in Malawi where he collected local varieties of field beans (Phaseolus vulgaris) and examined the biological and cultural forces that promoted genetic diversity in this crop. While working in East Africa, he observed the effects of a bacterial halo blight disease outbreak on field beans. The disease significantly reduced the bean harvest that year, and because this crop was the principal source of protein, it exacerbated the malnutrition of the subsistence farmers and their families. This was a pivotal experience that focused his interest on understanding the fundamental mechanisms involved in plant disease and in contributing to the development of new disease control strategies. Dr. Martin is motivated primarily by the desire to contribute to new strategies to control plant and human disease. He strongly believes that such strategies can contribute to solutions for the serious problems of environmental degradation, climate change, poverty, and hunger. Secondly, he is motivated by an inherent curiosity about the natural world -- in particular, how microbes and plants have co-evolved very sophisticated mechanisms for survival, and in fact to thrive, in a world that presents numerous challenges to their existence. 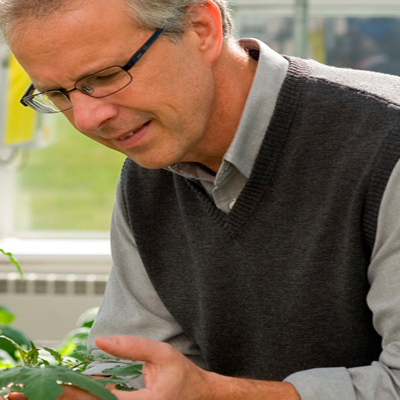 Dr. Martin's research takes a two-pronged approach to plant diseases. His work uses the interaction between tomato plants and a bacterial pathogen (Pseudomonas syringae pv. tomato; Pst) to understand fundamental aspects about how disease-causing organisms attack plants and how plants, in turn, defend themselves against such attacks. On the bacterial side, he relies on the more than 50 genome sequences available for Pst and the fact that it is very easy to manipulate this bacterium in the laboratory. This allows him to develop Pst strains that lack specific virulence determinants and test the impact on the bacterium to cause disease. From the plant-focused perspective, he relies on the tremendous natural variation that exists in heirloom tomatoes and wild relatives of tomatoes to identify and characterize the genes that contribute to the plant immune system. Over the years he has used the methods and concepts from biochemistry, bioinformatics, cell biology, genomics, microbiology, next-generation sequencing, plant pathology, and structural biology to facilitate his research. His research is a good example of how the study of both bacteria and the plant immune system can reveal solutions for dealing with plant diseases. Dr. Martin obtained his Ph.D. degree from Michigan State University under the guidance of Professor Barry Chelm while working on the molecular basis of nitrogen fixation in the Bradyrhizobium-soybean symbiosis. He was then awarded an NSF fellowship to conduct his postdoctoral research at Cornell University with Professor Steven Tanksley. 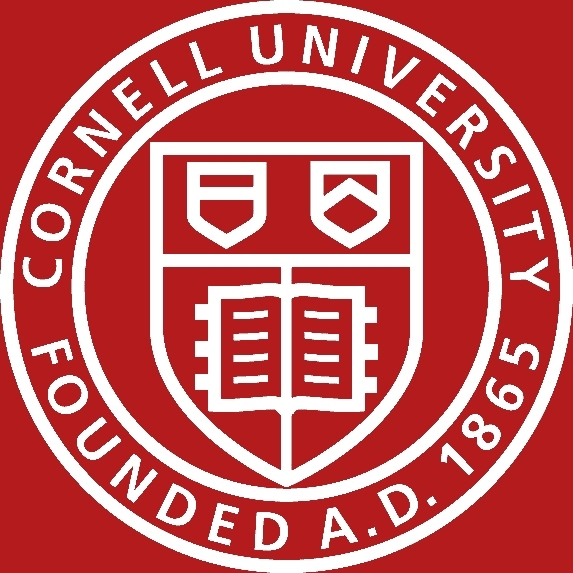 At Cornell, Dr. Martin began his research on the interaction between tomato and the bacterial pathogen, Pseudomonas syringae pv. tomato. As part of this work, he developed methods for using genetic linkage maps to isolate genes from tomato and cloned the first disease resistance gene from plants, Pto, which confers immunity to bacterial speck disease. Martin joined Purdue University in 1992 as an Assistant Professor where he taught undergraduate genetics and continued his research on the Pseudomonas-tomato system. In 1998, he returned to Cornell where he is currently a professor of plant pathology & plant-microbe biology and the Boyce Schulze Downey Professor at the independent, non-profit, Boyce Thompson Institute for Plant Research. Martin teaches an undergraduate course titled "Innate Immunity in Plants, Flies, and Humans" and a graduate course on "Molecular Plant-Microbe Interactions."